The Benefits of Yoga: A Scientific Approach. There are many different proposed benefits of yoga. I did a search on the internet and one of the first things that popped up was an article outlining the 38 benefits of yoga such as reduced diabetes, cancer, osteoarthritis, stress, anxiety, improved strength, and flexibility. 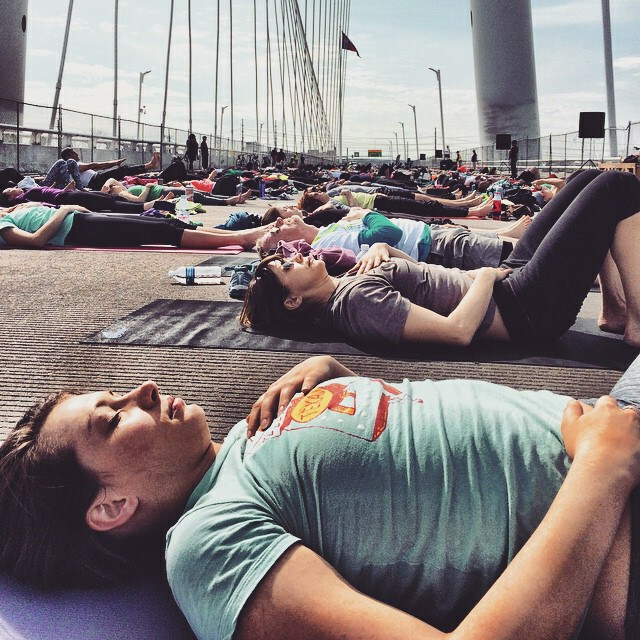 It seems if you can think of it, then yoga can either prevent it—or treat it. I am a yoga teacher and a health care worker and there is nothing I want more than to prevent or cure a disease with yoga. My science brain, however, will not accept these claims without research to back it up. I have set out to find the research behind these stories and present it to you. I personally have experienced the benefits of yoga, including: recovering from a running injury, reducing my anxiety and stress at work, and improving my relationships. That is why I am so passionate about sharing it with you. Pharmacy school taught me all about the drugs I did not want to take and I hoped nobody I knew would have to take them either. I am continually shocked by statistics that attest to drugs only working for 17% of the population and that can cause numerous life altering side effects such as kidney and liver disease, ear-ringing, thinning skin, diabetes, nausea, vomiting, diarrhea, and headaches. Once I started learning about how medications work, how little we actually know, and how some indications for drugs were originally side effects from that medication, I realized there was something wrong with our emphasis on treating and preventing disease. To compliment my pharmacy education, I decided to become a yoga teacher to help people prevent and treat illness without medication. I have found numerous articles showing the benefit of yoga in multiple different patient cohorts on mood, stress, and anxiety. As an example, I will highlight two of them here. The Journal Of Alternative and Complementary Medicine conducted a study called “Effects of Yoga versus Walking on Mood, Anxiety, and Brain Gaba Levels” over a 12-week period. Patients either did 60 minutes of yoga three times per week, or 60 minutes of walking three times per week. The yoga arm proved to have greater benefit in mood and anxiety versus the walking exercise only group. A new study published in February 2018 in the International Journal of Preventive Medicine, “The Effect of Yoga on Stress, Anxiety, and Depression in Women,” found that there was 21.5, 26, and 28 percent improvement in depression, anxiety, and stress respectively after four weeks of 60 to 70 minute specialist-provided hatha yoga (three times per week). There is a lack of research in the area of potential diseases prevented by yoga. However, as discussed, yoga has proven beneficial effects on stress and anxiety. A search on webmd.com for stress-related diseases showed heart disease, asthma, obesity, diabetes, headaches, depression, gastrointestinal problems, Alzheimer’s disease, accelerated aging, and premature death. Due to the evidence that yoga does help with stress and anxiety, one might conclude that practicing yoga could potentially help with preventing the above diseases. As was mentioned previously, cardiovascular disease may be attributed, in part, to stress. So it is natural to assume that yoga might be of benefit here. Indeed, the research does show some modest improvements. Biomarkers that are used to calculate one’s risk of heart disease such as blood pressure, lipid levels, weight, and blood glucose, have been shown to be modestly improved with yoga. A Cochrane database review of all the studies available that looked at yoga and the prevention of cardiovascular disease found a lack of high quality research. The investigations had short durations or small sample sizes. However, the analysis of the studies all concluded that a yoga intervention decreased diastolic blood pressure by -2.9 mmHg, triglycerides by -0.27 mmol/l, and increased HDL cholesterol (“good” cholesterol) by 0.08 mmol/l. A short, but fairly large study was conducted in patients with Type 2 diabetes or who are pre-diabetic. A 10-day yoga lifestyle intervention was tested and fasting blood glucose (FBG) was recorded before the intervention at an average of 133.1mg/dL and after the yoga intervention the average FBG level was 121.19mg/dL—a drop of 10%. In another meta-analysis performed by Paula Chu and Rinske A Gotnik, it was shown that yoga improved body mass index with a mean weight loss of 2.32 kg, a decrease in diastolic blood pressure by −4.98 mmHg, and an improvement in total cholesterol of −18.48 mg/dl. This study found these improvements among those who did yoga and exercised compared to those with an inactive lifestyle. Dr. Yeh says, “Each of these elements positively affect cardiovascular risk factors, so combining them was bound to show a benefit.” In this article, Dr. Yeh also explains how yoga is not as strenuous as other forms of exercise and is easily modifiable and, therefore, also good for people who are recovering from heart attack or heart surgery. The meditation or savasana (relaxation) part can help people cope with the stress of illness, eat better through awareness, and aid sleep. It is said in the Baghavad Gita that he who eats sparingly, who sleeps just adequately, and who is skillful in action—for such a person yoga becomes a “killer” of duhkha (distress or misery). I found one article that included cancer prevention in the title and the quote above from the Bhagavad Gita supports the notion that yoga plays a role in preventing cancer. All signs seem to point in that direction. Yoga has been found to help with the stress of being diagnosed and having to go through treatment for cancer. The International Journal of Nursing Science published an article called “Effects of Yoga on Negative Emotions in Patients with Breast Cancer: A meta-analysis of randomized control trials.” This article looked at 21 different trials comparing people who practised yoga to non-exercisers and found improvements in anxiety, depression, distress, perceived stress, and emotional wellbeing. This study also concluded that well designed trials with larger sample size and longer term follow up are needed. There is a lot of research to back up using yoga for pain alleviation, and in particular, lower back pain. The use of yoga in this application is significant because a majority of us will experience this at one time or another in our lives. In one study in Annals of Internal Medicine they compared yoga classes vs. physical therapy vs. educational material for patients with chronic low back pain. One of the promising outcomes was that the patients who were in the yoga or physical therapy arm were 21% less likely to require pain medications than the education alone group. I also found an article on Elephant Journal that discusses how yoga helps lower back pain. I have experience with lower back pain and my doctor recommended yoga. At first, I believed I injured myself further because I didn’t have the awareness of how to stretch my body in a therapeutic way. I was just following along in a high-paced vinyasa flow class jamming myself into the shapes I saw others doing. It took finding my teacher, Eoin Finn, who teaches you how to slow down, feel your body, and breathe into tension when practicing so you don’t go too far, to aid my recovery. We, as health care providers and yoga teachers, need to do more than just tell patients to do yoga to prevent or treat injury; we need to help them find the appropriate style and teacher. I searched yoga and memory impairment and the studies that came up were about meditation. Meditation is defined by The Yoga-Sutra of Pantanjali as an integral part of the yogic path and one that has been important to me. It has improved many aspects of my life, so I wrote about it in Elephant Journal. The research is in its infancy but The Journal of Alzheimer’s disease published a review of where the evidence stands for Alzheimer’s disease Prevention. RR (Elicit Relaxation Response) is achieved by repetition of a word, sound, or movement and passively letting thoughts go. Subjects were asked to do this for 20 minutes twice a day. This technique has been shown to decrease hypertension and improve insulin resistance, which may be risk factors for Alzheimer’s disease. RR has also shown multiple general cognitive health benefits. TM (Transcendental meditation) is a prescribed sound, silently repeated, 20 minutes twice per day. It has been shown to lower cortisol levels. In one study of long term TM participants, it was found that they were physiologically 12 years younger than their chronological age. There was a 48% reduction in deaths from heart disease in people who practice TM. MBSR (Mindful Based Stress Reduction) is a Buddhist-approach focus on breathing up to 40 minutes at a time. It was shown to improve sleep, mood, stress, and fatigue. A study on patients with cognitive decline and their caregivers showed an increase in quality of life, fewer depressed symptoms, and better sleep quality. KK (Kirtan Kriya) incorporates breath, posture, sound, and hand position. I did this meditation this morning when I was feeling pretty lousy and after the practice, I felt fresh and ready to jump into writing this article. I already have a meditation practice I have been experimenting with for the past couple of years, and after doing this research I am keen to give this one a try for the next 30 days. This study describes an eight-week at-home practice of 12 minutes per day of the KK technique and researchers found many improvements on the brain. It was also found to boost mood, energy, emotional wellbeing and improvement in sleep. Discovering spirituality and purpose in life no matter what the origin may reduce the risk of cognitive impairment and Alzheimer’s disease. My teachers, Sharon Salzberg and Krishna Das, encourage us to try different meditation techniques to see what fits for us. There are numerous ways to meditate and each has the potential to benefit the individual. The main point is to find something that works for you and do it every day even if it is just for five minutes. According to research, 10 to 20 minutes might be better. With this research, I think medical professionals and patients alike can be confident that they will derive some benefit from trying a regular yoga and meditation practice maybe leading to fewer medications needed to treat certain ailments. Please do not stop taking any medications or start any new exercise regimen including yoga without first talking to your health care professional. We are living in an opportune time where we can combine eastern philosophies and western philosophies to help treat and prevent illness. Both can certainly be of benefit and there is no reason why they cannot be used together with proper supervision from your doctor. Currently our society is fueled by quick fixes and the medical industry has fallen prey. With more attention and wider availability of yoga and meditation we can slow down and not jump on the “treat with a medication first” philosophy. We can also incorporate these techniques before getting sick. I hope with this information that we in the medical community, and anyone interested in taking an active role in their own health care, can take notice of potential benefits from non-pharmacological interventions and recommend yoga when appropriate. I am looking forward to increasing my knowledge in this important growing field at “Yoga + Mind Body Medicine” with Eoin Finn and Dr. Lawrence Cheng this summer. Yvonne Perry is Canadian and currently living in Manhattan. She enjoys yoga, running, learning, and writing. She is enjoying learning about eastern philosophies and is keen to share with others the benefits that she has been receiving from these teachings. 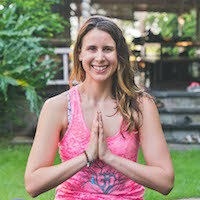 Yvonne is an oncology pharmacist and a RYT 200 Blissology yoga teacher. Even though Yvonne has been working to help treat illness for the last 14 years, she would also like to help prevent illness by inspiring health with love and light.